Quote: "But loading in via the shader still creates just a flat color"
What have you done before ? So you add your desired texture as the first texture parameter and fill the others with something else. And a completely transparent splat-map as the last parameter. The result should be the base texture only. Just draw with red=255,Green=0,Blue=0,Alpha=0 to into the splat-map. Now you should get two textures. If that doesn't work something else is wrong here. I am referring to the textures. I can only get the ones you provided in the example to work. I am attempting to learn how to make them in the same manner. I don't have any problems with the splat map, and I understand how it works. Hi janbo, would be super nice if this could work along with Rons VR extension. But no hurry. 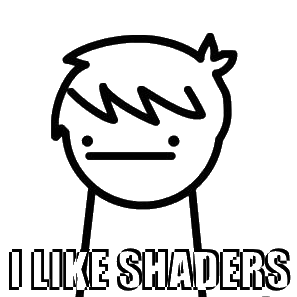 Right now I'm scavenging the 'Useful Community Shaders Project' thread for VR friendly shaders. Lots of broken stuff, but hidden treasures too. janbo wrote: "Just created the command set to setup the waves and foam. The Waves are setup with a random parameters by Default." Quote: "Are you planning release the water update?" Of course, but I'm not sure how to time it, I wait for TGC to let me know when it's time, until then I consider/play with other effects. Thanks mate and keep up the good work! @janbo : Are you able to release the Ocean / Sea foam shaders? Hey thanks for the new update Janbo !! Do you have a Patreon.com account ? Does the depth texture work on android? "Note that some devices (particularly Android) do not support rendering depth to an image, in these cases the only valid values for the depth ID are 0 and -1." Any news about the water upgrade? there is no separate Ocean Demo for the Ocean shader... It is demonstrated in the Collection Demo though. janbo wrote: "there is no separate Ocean Demo for the Ocean shader... It is demonstrated in the Collection Demo though." It's just what I was looking for. Thanks janbo!! Should the Shader Pack appear in the IDE DLC menu? I have the shader pack in my steam library, but it's not appearing in the IDE (I'm sure it was there before). EDIT: Fixed it! I un-ticked the shader pack in steam, then re-ticked it and it's back. I have a difficulty using the shader pack. AtlasCombine.pc is a shader file and should be located in your projects main/shader folder. Could be, depending from where you copied from not all shaders are in there. But in Tamplates/shader there should be all shader included. Also make sure to write the folders first letter in upper case as Android is case sensitive. EDIT: Thank you janbo, the first letter wasn't in upper case. It works now! I my experience shaders are a bit more intense on older hw. On my Galaxy phone no problem. 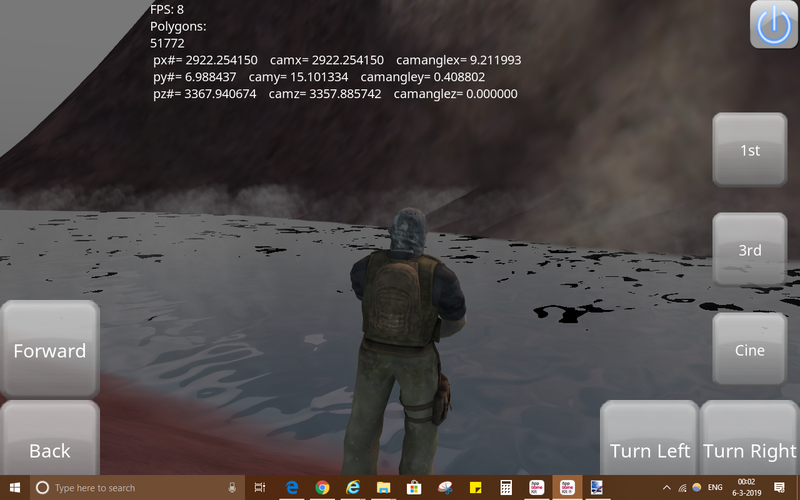 On my old HP laptop from 2007 (and not really build for top notch shaders) it's nearly unusable so there I use janbo's very first "Water for all" shader, which makes a big difference on fps. Might be an idea to include in the package? But then again, if people want to use it they can download it from the site I guess. I don't know how fast my tablets are. It is a Samsung Galaxy Tab S2 and an Asus ZenPad 8. I have to admit that I have never played games with high graphics requirements. Is there is something that I have to take care, or this is the limit? My old water shader shouldn't make a big difference in performance. You could try to comment out the lines where I mix a bigger version of the textures into the final color values depending on the distance so you can't make out any pattern so easy. Do you have many objects in your scene ? Thank you janbo for helping me. 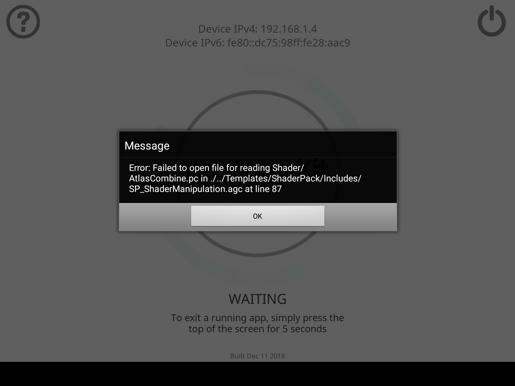 Unfortunately I cannot modify the shader code since I have no knowledge on this topic. I got another Idea why it could be a little bit slower for the mobile version especially. but in AppGameKit there is no depth support for mobile devices so I made my own which of course adds a tiny extra cost of performance to encrypt and decrypt the depth image with AGK's toolset. Quote: "Do you have many objects in your scene ?" Does this have impact to the shader? But again that shouldn't be a big performance hit. some of them seemed to be a big part of the pack and, i like the idea of using one of the shaders and not use the complete code that comes with them. could be handy and not the whole pack. With that said i love the way you supply the shader code with them, which does allow the above just hard to get some of them to work without the pack. I am glad it has the code seperate to the shaders, and was skeptical tho wether i should make the purchase thinking they might all be part of a encrypted pack. Yeah I thought of all of that and it's right, you can't just lets say use the SSAO part of the library as it depends on SP_Init, SP_ShaderManipulation,SP_PostProcessing and then SP_Init depends on some other includes again. I don't think it's possible to make it like an immediate-mode-effects-library where you set some parameters, draw it and everything is fine. They work together, you can see that pretty easy with fullscreen shaders if you change the order of those few lines in SP_init you might get a whole different result. If you know of a better layout then feel free to suggest it here. But you can get away with those three includes if you strip down the other effect functions from the SP_Init and SP_Lighting file, then the many little functions come to fruition too. About the raw shader files.. it's probably not communicated to good. Little update to show what I'm up to lately. but AppGameKit doesn't give us the ability to render to Cubemaps so the Cube sampler in GLSL isn't useful to us much. So I made my own using a more compact Horizontal-Cross-Layout, for performance. As you can see you only need to move the top piece into the bottom right corner, and we save a third of the texture size. My shader is currently capable to render the texture on the fly and calculate the skyboxes fragments like a normal cube map using a 3D Vector like you do with the normal Cube sampler in GLSL. The single faces are 256x256 pixels in size so the whole cube atlas texture is 1024x512 pixels in size, rendered each frame. Now all that wasn't my initial goal, but I wan't to be able to create dynamic point light shadows in the future. As you might now I have the shader code for directional light(sun) and I managed to render depth textures in my shader pack for mobile devices and html5 which doesn't support depth textures by default. If everything goes well I should be able to take all that and plug them together, to present you dynamic point light shadows on mobile devices. Silly noob question......how does paralax mapping differ to normal mapping? Quote: "Parallax mapping (also called offset mapping or virtual displacement mapping) is an enhancement of the bump mapping or normal mapping techniques applied to textures in 3D rendering applications such as video games...Parallax mapping is implemented by displacing the texture coordinates at a point on the rendered polygon by a function of the view angle in tangent space (the angle relative to the surface normal) and the value of the height map at that point. At steeper view-angles, the texture coordinates are displaced more, giving the illusion of depth due to parallax effects as the view changes." Normal mapping creates the illusion of depth by darkening the pixels facing away from the light using the normals encoded in the normalmap. Parallax mapping like the name implys calculates several layers which shift the uv coordinates according to the view direction producing a parallax effect you know from 2D games like starfields. Now this shader actually is parallax occlusion mapping and has a dynamic range of layers depending of view angle and interpolates between the layers. For now you need a heightmap and normal map for it to work but I want a version that calculates the normal from the heightmap so you could draw valleys with only altering one texture(heightmap). But for some reason I failed at calculating the normal from the heightmap which should be the crossproduct of the distance between the center fragment and two of the neighbor fragments. Was doing a bit of experimenting with the 3d Camera example and added some stuff among which your water shader. Is there a way to get rid of the very dark patches? Not sure, thats probably caused by not clipping properly. Looks like a part of the refletion/refraction isn't working. Did you add the terrain to the sytem with SP_AddObject or SP_Clipping_AddObject. I can offer you to take a quick look over your code. You can show the reflection/refraction debug imags with SP_Water_Debug_ReflectionVisible. I don't think I added the terrain like that. I just used something I had in Blitz3d with a large texture and detail texture applied to it. The code is pretty messy, bit of a kludge just to see quick results. Forgot to mention: this contains source and media, for I'm not using all the standard stuff(added some stuff). I didn't use the terrain shader. as wasn't used in the original example too. Do you think this part of the problem? Wasn't even aware of these. Would be helpful to have a list of all these commands, perhaps I missed that somewhere. I don't have the artifacts so extreme like you, but if you add SP_AddObject(player and landscape) at the end of your subroutines you register those objects to the library which then injects the clipping code needed by the water effect to properly do the relfection and refraction render images for you. Hmmm, rather odd. Must be my GPU then? I can add SP_AddObject(player) to the create_player and SP_AddObject(landscape) to the create_landscape subroutines, but it somehow seems to effect the fog so badly that is being reduced. And it doesn't kill the dark effects on the water. Any idea what to do and where to add what or is it just not that suitable for this type of environment? Would the ocean shader work any better? 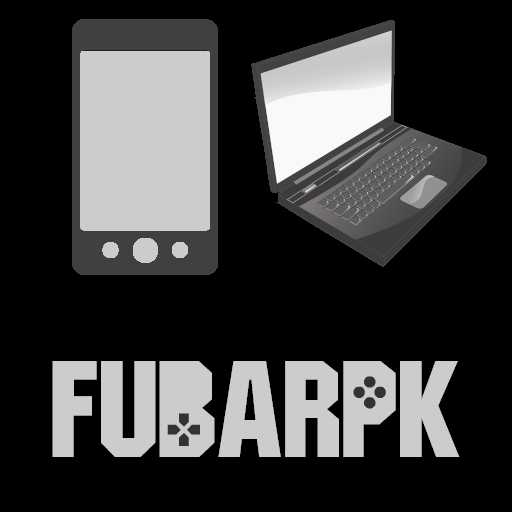 Did a broadcast to my phone, which I then let stream to my TV. There it's far less evident, virtually non-existent. So must be the low fps or gpu. @Rick N: You have got a PM. Yes SP_AddObject(landscape) and SP_AddObject(player) is coreckt. Also make sure its placed after you made all the modifications to the objects. I tested it on my notebook and had to remove the precision specifiers at the top of the water.ps file to get it working. It looks a bit like its missing a clamp but it works on all my devices and was tested by some of the comunity too, so could also be a precision thing. 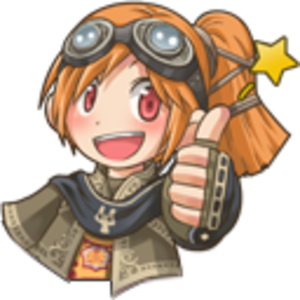 I will review everything on my main PC today and see why the clipping code interferes with the fog. Regarding the fog effect: I can't take every customisation into Account to work with the clipping injection code, so you might need to do the changes to your shader manually. Quote: "Would be helpful to have a list of all these commands, perhaps I missed that somewhere"
A command list is in the User Guide.pdf in your DLC folder at page 18 and higher. Quote: "but it somehow seems to effect the fog so badly that is being reduced"
also important commands you should be aware of are SP_Ambient_SetColor(),SP_Sun_SetDirection/Color and SP_SetClearColor() in general. They also do the AppGameKit intetrnal setups for you. Best practice is to use the library functions in the first place so they are in sync. When sending files please be sure not to include any files that are paid for, I have removed your download link and added a warning to your account. I am sure it was accidental but we still issue warnings. Janbo, could you do something like this? I guess its a portal with one input but many outputs. This is an interesting topic which I already looked at myself as portals are usefull for many things. Yeah, I read about how Spider-Man used this technique, and I'm not gonna lie......I actually thought they had modelled the rooms, spent a good bit of time crawling across buildings looking for the secrets. They use quite a number of different textures though, so the effect is really convincing. I've torn my clothes, put ashes on my head and my face is in the mud. To be seriously: I'm sorry: wasn't my intend. Didn't even stand still and think about it, was too focused on the issue(plus some other things on my mind, midst of job change). @Santman: unbelievable stuff! Wouldn't have imagined that. You are welcome and please don't hesitate to ask more questions.